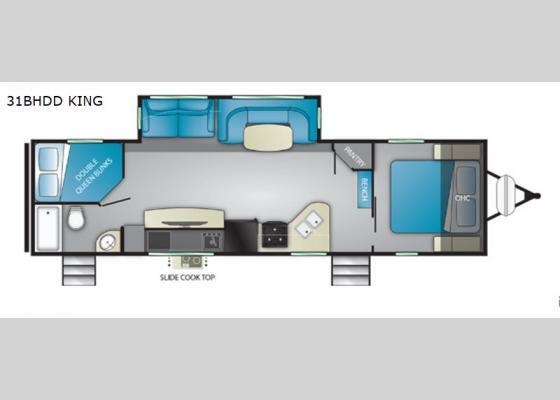 This camping season come choose to camp in this single slide out 31BHDD North Trail travel trailer! It is easier than ever to camp with your whole family or even a few friends since there is a set of double bunk beds in the rear. Enjoy your meals at the U-shaped dinette and at night this area can convert into additional sleeping space. Mom and dad can retreat to the private front bedroom where there is a queen bed. You will find that this model has two entry doors - the front door leads into the combined kitchen/living area, and the rear door leads into the bathroom so you can easily access the bathroom from outside. With the outside kitchen you can easily prepare your dinner or lunch while watching your kids play! This North Trail travel trailer is also available in a Caliber Edition. For a lightweight travel trailer that is not lacking on features you will want a North Trail by Heartland. Along the exterior there is a heated and enclosed underbelly which allows you to camp in all types of weather! You will also find a one piece rubber roof plus nitro filled radial tires. Inside enjoy the extra space with the curvilinear roof, LED lights, and the Beauflor flooring. The NT Kitchen Package includes upgraded brushed nickel hardware, a large kitchen window, a pull out spray faucet and more. The Lightweight Strength Package has block foam brick insulation, HD leaf spring suspension, and a Weather Guard thermal protection, plus so much more! What I liked most: Ease of use, comfortable beds, accessibility at rest areas with slide out in. What I'd improve: Better lighting in bathroom.